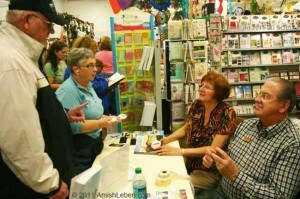 The Gospel Shop began as a small shop in David Stutzman’s home in 1966. His goal was to create a place for people to find inspirational products. He created just that. Since opening in the family home all those years ago, The Gospel Shop has been housed in an old doughnut shop and a library before finding its home in a storefront on E Main Street in Sugarcreek, Ohio in 1987. While David Stutzman is no longer the owner, The Gospel Shop is still in good hands with his daughter Rhoda Mullet and her husband Freeman. Rhoda grew up helping her father in the shop and learned to love it there. She became the owner when her father stepped down and has been running the shop with her husband and employees, Laura Yoder and Leona Stutzman. There are many things to find at The Gospel Shop. It is not a place that only sells books, but all kinds of inspirational products. There is a room located at the front of the shop that houses Christmas decor and festive items to help customers celebrate the holiday season. Throughout the rest of the store, a variety of faith-based and inspirational merchandise can be found. Clothing, purses, cards, Bibles, music, as well as a section dedicated to children are all part of the welcoming atmosphere at the shop. And if you can’t find what you are looking for on the shelves, they will gladly look into getting it for you. The Mullets are active members in the Sugarcreek community and are happy to have a connection with the people around them. Freeman has helped with the restoration of the Cuckoo Clock as well as other projects to help with the beautification of the downtown area. They feel that it is important that their town be presented to others at its best. 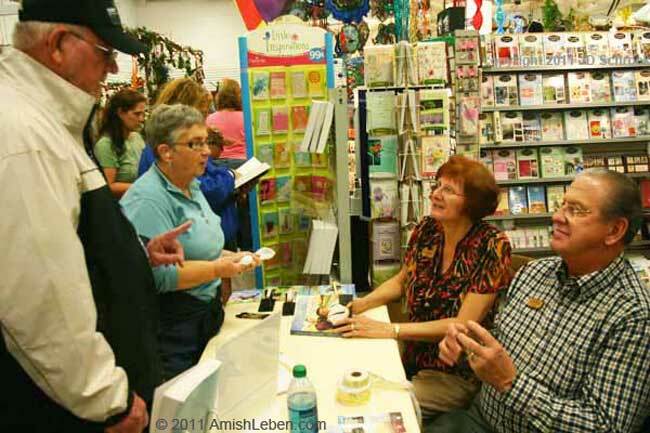 The Mullets will celebrate their 45th wedding anniversary next year and enjoy the way the shop spreads the love of books and the Lord. Located at 112 E Main Street in Sugarcreek, The Gospel Shop is an excellent place to stop in and find the perfect inspirational item you’ve been looking for.